Internationally acclaimed California artist, Sandy Delehanty has an extensive resume in both oils and water media as well as a full plate as a workshop instructor world-wide. Sandy claims she is obsessed with painting and never runs out of ideas, which is evident in looking at her growing portfolio. With a BFA from California State and numerous studies under renowned artists, Sandy’s design and style in all her work are uniquely her own and beautifully rendered. Sandy purposefully chooses her subjects for their bright colors, and the subject dictates the medium she’ll work in. 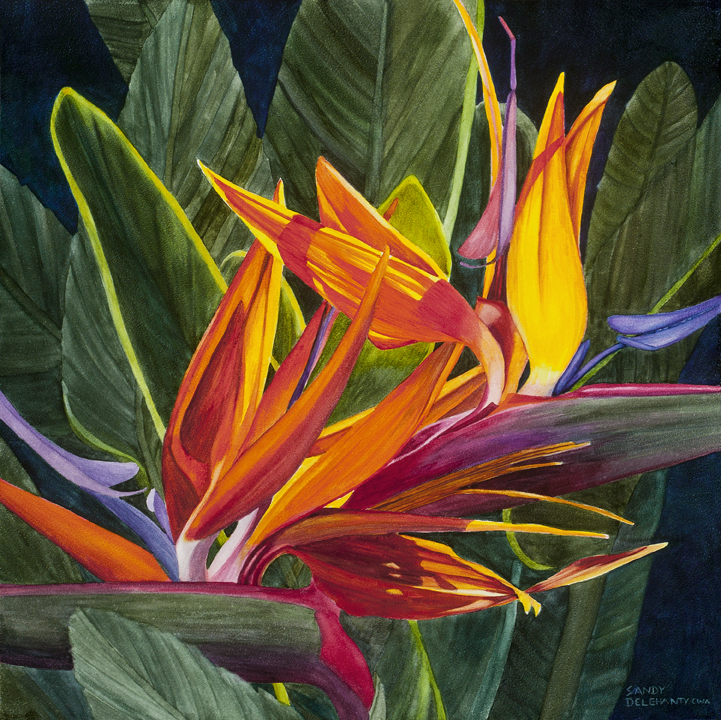 “Tropical flowers look best when painted in watercolor on Aquabord™ because of the intense color that Aquabord makes possible. I started my Aquabord adventure with a zebra painting, and I still choose watercolor on Aquabord to paint animals. 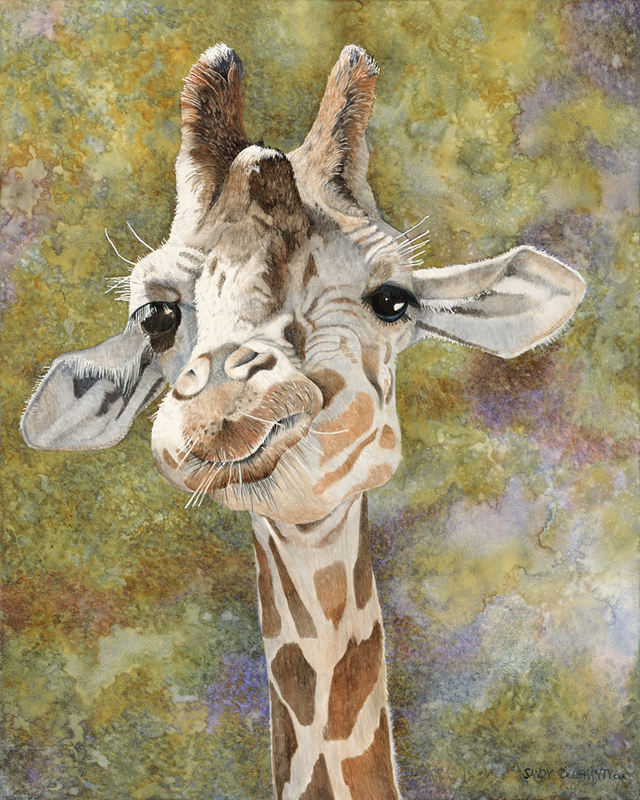 Tongue Tied my giraffe painting was so much fun to paint on Aquabord because I used wet in wet, slipping, sliding, pouring and spraying of watercolor to create the background.” Tongue Tied recently won the second place award in painting at the 8th Annual “Animal House” Open juried show at the Sacremento Fine Art Center. “I also chose Aquabord when I painted Venetian Masks because I wanted to use a lifting technique to create the feathers and no watercolor surface lifts as well as Aquabord. 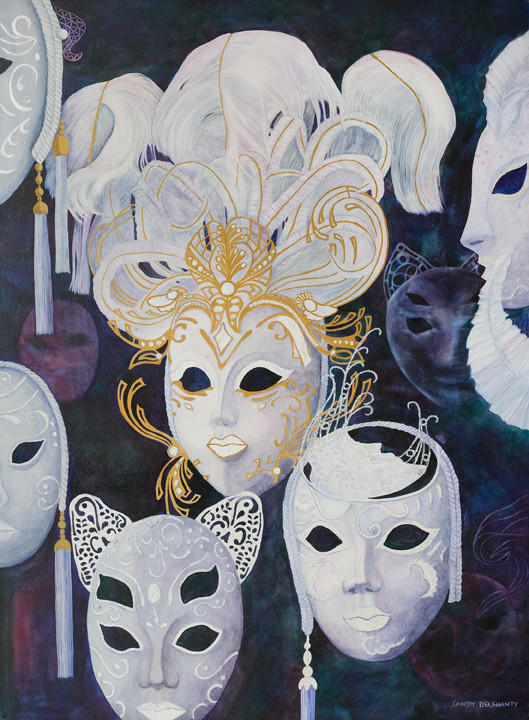 I used iridescent watercolors on the masks to add sparkle,” she explains. Really interesting work. Nice article. I love using Ampersand Aqua Board.